Indo-Chinese is a cuisine of its own. 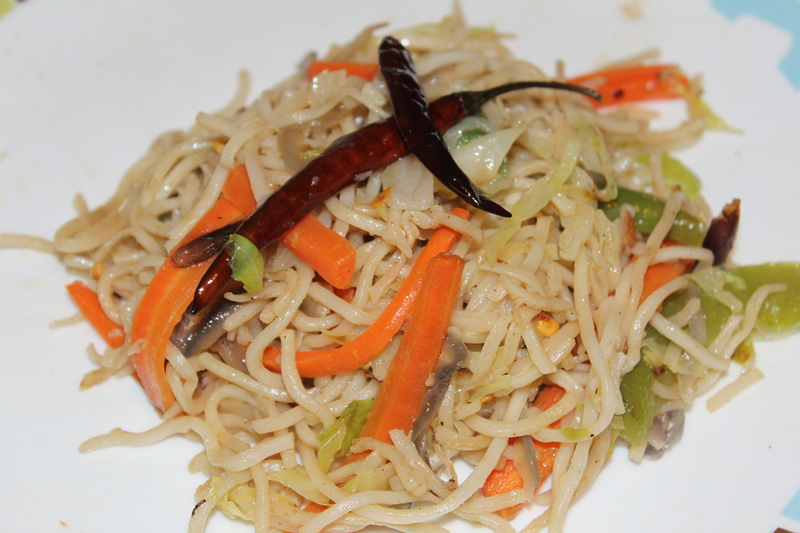 Although it probably started as Chinese food fashioned for the Indian palate, today it is respected on its own. And it is one of my favorites! 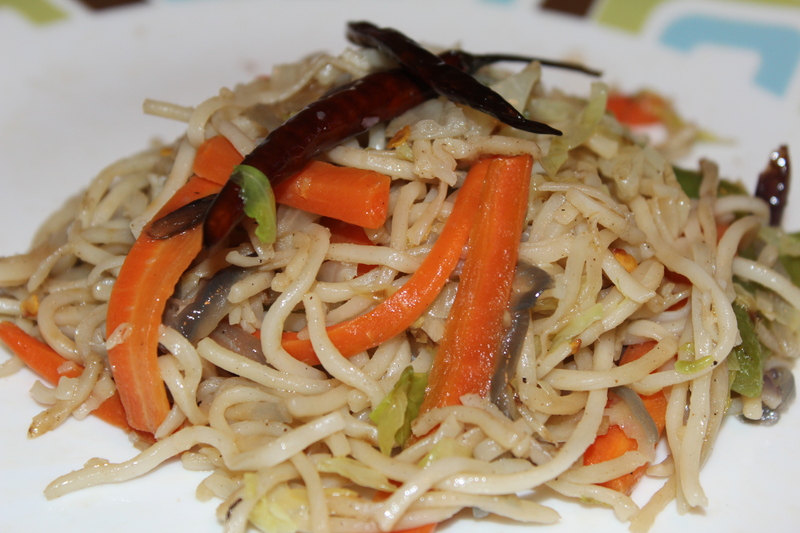 One of my best Indo-Chinese preparation is Hakka noodles. Now, I have to forewarn you…getting this perfect is a bit tricky. But I will do my best to give you all the tricks of the trade to make it close to perfection. The one good I love about my preparation is that you can add as many vegetables and proteins to make it real healthy and yet real yummy for your family. Use the directions on the packet and cook the noodles. Once cooked, run it under cold water and add some olive oil and mix it up. That way the noodles wont stick together. Keep it aside. If you have any proteins to add, prepare them. For eggs, simply scramble them with salt and pepper. Cut the tofu in cubes and stir fry them with salt and pepper. Keep aside. Pour some olive oil on the wok and under high heat, toss the spices together. You can add more red chilli if you want it to be more spicy. Toss the garlic in next and then add the onions and the white part of scallions. In 30 secs, add carrots, beans, asparagus, and stir for 1 minute or 2. If you want to add scrambled eggs or stir fried tofu, now would be a good time. Then add in the cabbage and add salt. After 1 min, finally toss in the noodles. Add more oil if need be. Toss together for another 1-2 mins and finally garnish with green part of finely chopped scallions. Before serving, you can add the soy sauce and white vinegar, but it is optional. That’s it. Its done. Serve immediately and gobble it up.